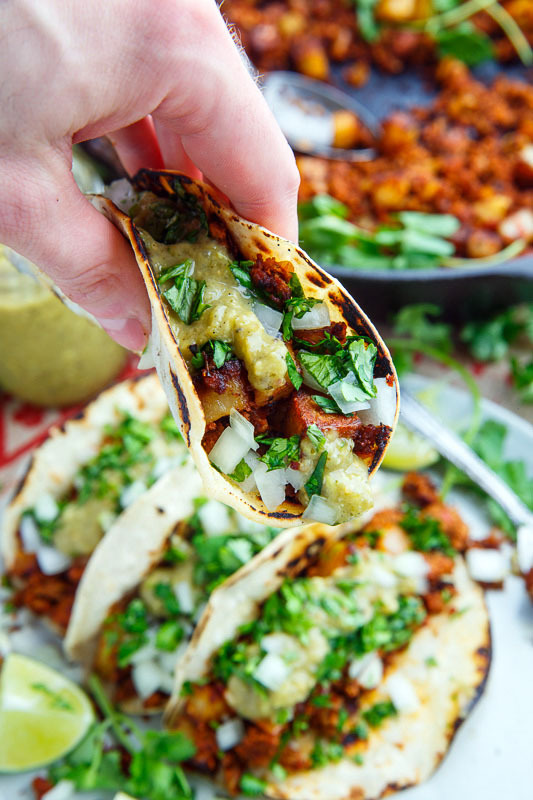 Tasty chorizo and crispy fried potato tacos with salsa verde, onions and cilantro! 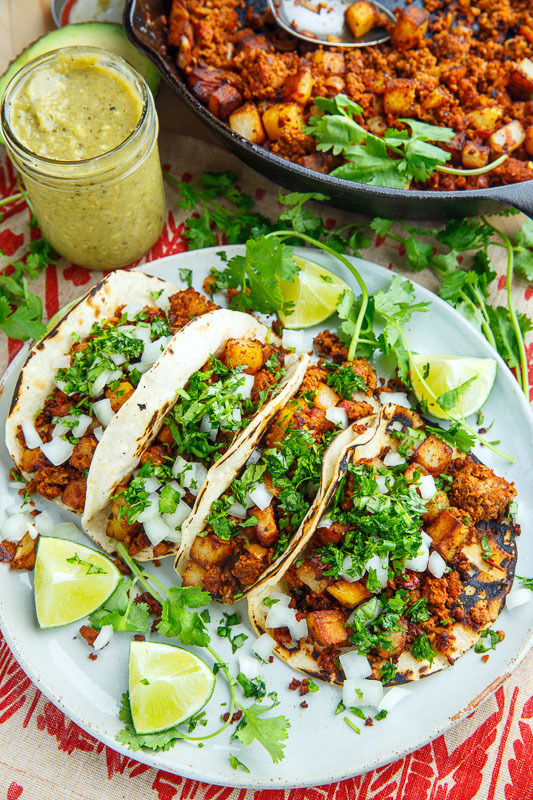 Today is Cinco de Mayo and I am celebrating with these tasty chorizo and potato tacos with avocado salsa verde! 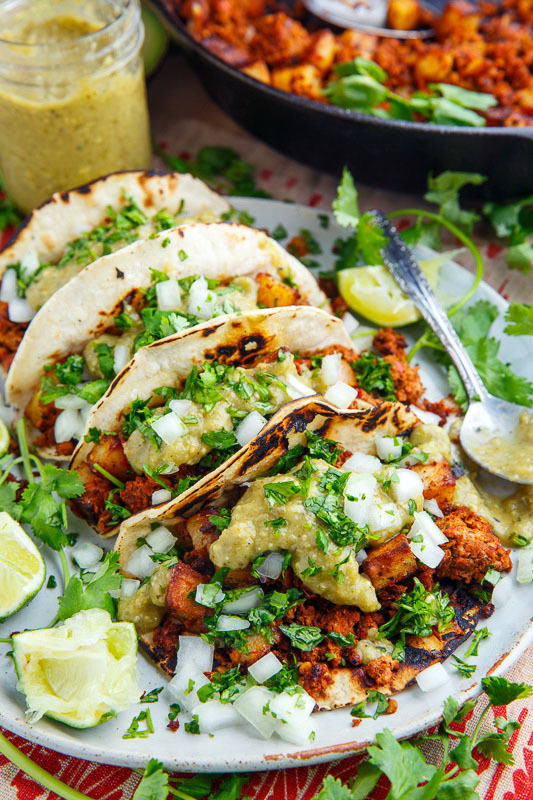 These tacos are so easy to make! 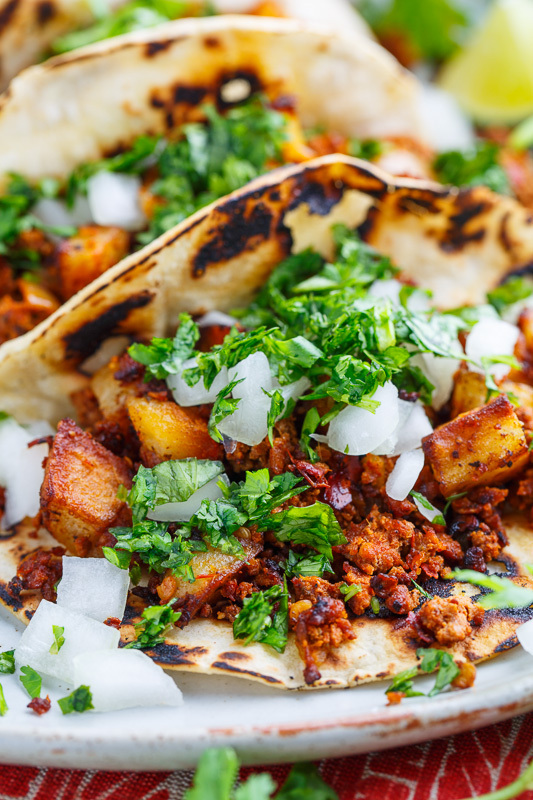 You simply fry some diced potato until crispy and golden brown, add the chorizo and onions and cook some more before throwing it all into some warm corn tortillas along with fresh diced onion, cilantro and the salsa verde! I use homemade chorizo and homemade salsa verde when I can but store bought makes things a lot easier! I like to add cool and creamy avocado to these tacos, either diced or pureed into the salsa verde and I finish things off with a squeeze of fresh lime juice! Have a tasty Cinco de Mayo! Puree the salsa verde and avocado in a food processor. Heat the the oil in a large pan over medium high heat, add the potato and cook until lightly golden brown on all sides, before adding the sausage and onion and cooking until the chorizo is cooked. 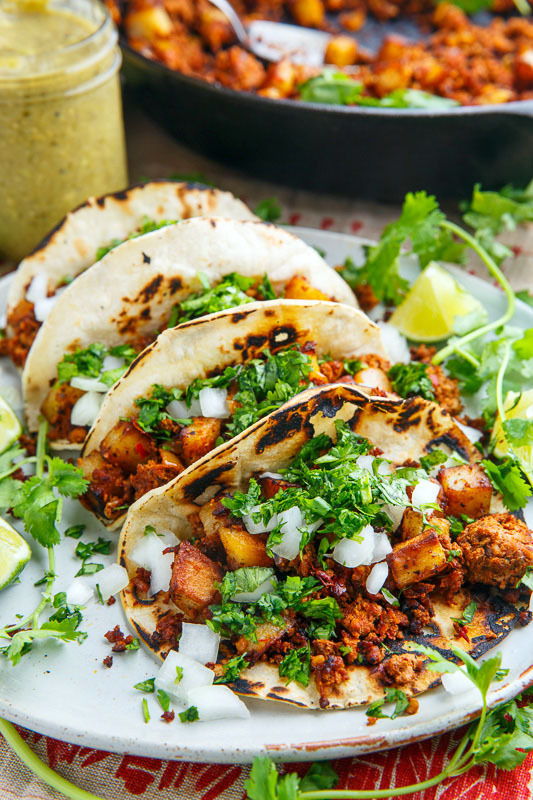 Serve the chorizo and potatoes in the tortillas along with fresh diced onions, cilantro and the avocado salsa verde. Option: Add your favourite taco toppings! What a great feast for Cinco De Mayo! 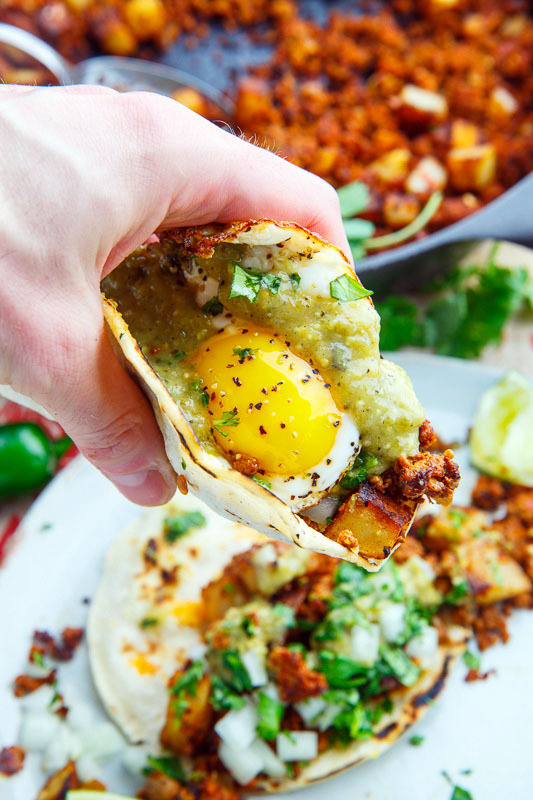 It's like a Mexican hash (especially when you add the eggs)! Great idea and I love your sauce. Please tell us what kind of potato you use, whether you peel them and how small you cut them up. Also, do you precook them before browning them? I am curious too about the potato. 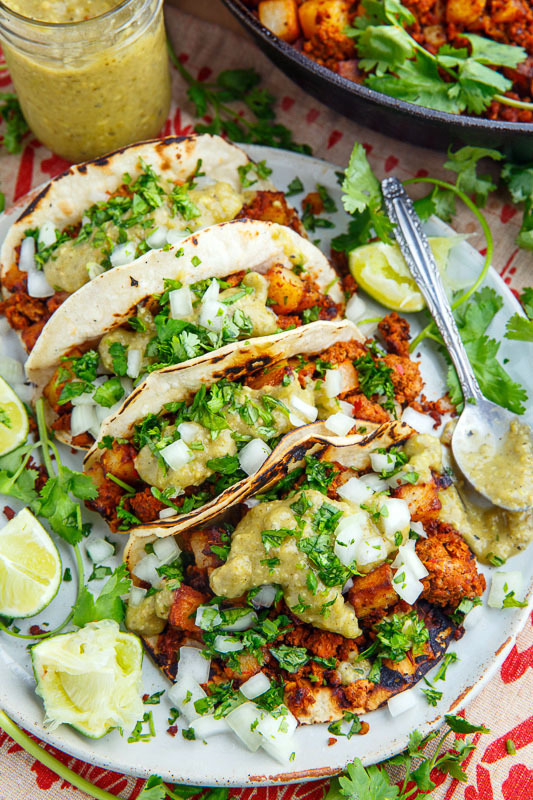 I absolutely love these tacos- the flavors are awesome! For a short cut, try canned roast beef hash with a pinch of garlic powder, cumin and oregano. Yo. Spell check!!! Cause I'm not serving these in gorillas! This is a simple, delicious recipe to make. I like adding a dollop of sour cream on top. Reheats very well.